You can register online or over the phone, call Jocelyn at 541-345-1571, or e-mail education@mkartcenter.org for more information. We also have Gift Certificates. You can register for classes online, in person with cash, check, or credit card, or by mail with check or credit card. Scholarships are available based on financial eligibility. For more information contact the Art Center. Weather Advisory: In the event of bad weather, the Art Center will close if Lane Community College is closed. Classes for that day will be cancelled and a make-up session will be held at a later date. In the event that Lane Community College is delayed, all Art Center classes before 12pm will be cancelled. Call 541-345-1571 after 12pm on the day in question to check for afternoon and evening classes. The Art Center has a parking lot that is reserved for Art Center students, visitors, and staff. Street parking permits available before class! Class Refund/Cancellation Policy: Refund is available five business days prior to the first class. There are no refunds after the first meeting. Cancellation of Workshops/Camps: Full refund if request is made five business days or more prior to workshop. If refund request is made two days prior to the workshop, fees and 50% of tuition will be forfeited. No refunds one day prior. Please ask for a materials list when registering. Unless otherwise noted, materials are not usually included in class fees. Drawing is one of the most basic skills for creating successful paintings. This class is for students who have had some watercolor experience, but either haven’t had much drawing experience or they want to sharpen their drawing skills. Techniques and exercises will be geared toward developing better drawing skills, learning how to put together a composition, and transferring that composition onto watercolor paper. Previous watercolor experience is recommended to be able to translate those skills into drawings for painting. Learn to paint with watercolor in a variety of ways during this eight- week introductory course. Through class demonstrations and individual instruction, we’ll learn about how watercolor behaves as a medium, and practice methods of color mixing and layering. We’ll work from still lives and imagination to explore the capabilities of watercolor, and use it in tandem with ink drawing to broaden its possibilities. Watercolor has a very long tradition, and we will study the work of exceptional watercolorists from the past as well as contemporary masters to discover new inspiration. There’s no need to be intimidated by this versatile medium, come find out what wonders a little bit of water and pigment can do! Advanced Life Drawing builds on the previous class, Life Drawing, taking the analysis tools we learned for observing the human form and delving deeper into the structure, anatomy, and movement of the human body. We also explore foreshortening in this class. We broaden our knowledge and media practice covering the use of pastels, pen-brush and ink, graphite while continuing to develop a grounding with charcoal. Emphasis is placed on strengthening the personal voice alongside a deepening of observational skills and practice.This course is suitable for students who have a good understanding of drawing from observation with charcoal as well as students who have taken the foundational Life Drawing class. As with the previous class, individuals of all experience levels are welcome since all of my classes are given in a supportive, closely led environment. Join your instructor Sandy Brown Jensen on a journey to master your iPhone camera. In this 8 week class you will learn how to edit and how to use, select, high-powered apps to get artistic effects. We will do both studio and field trip photo shoots depending on the weather, reliable transportation recommended. You will also be able to make your own free printed book with the beautiful photos you took in class! You can register online or over the phone, call Jocelyn at 541-345-1571, or e-mail education@mkartcenter.org for more information. This 8-week long class will cover multiple screen printing techniques. We will learn how to turn your designs into hand painted screens to print as posters or on t-shirts, tote bags, or any fabric of your choosing! We will also go over the process of printing with hand cut stencils and create a multi-colored series of prints. Come learn the special process of making one of a kind prints! You can register online or over the phone, call Jocelyn at 541-345-1571, or e-mail education@mkartcenter.org for more information. Drop-ins are welcome. There is an $11 drop-in fee. 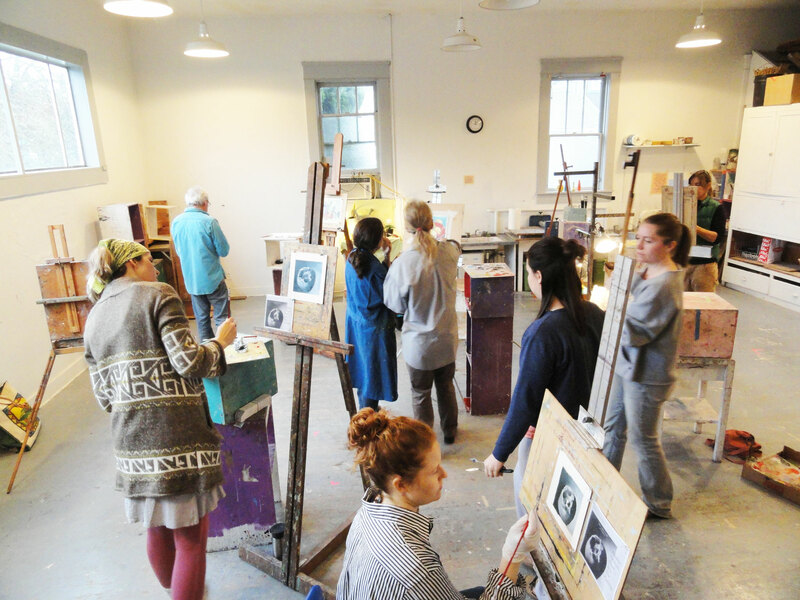 The Art Center invites artists to become a part of our Open Studio Sessions. Model poses vary and are selected to acommodate artists' needs. Sign up for the whole term and receive a sizeable discount! Drop-ins are welcome. $11 Drop-In Fee. The Art Center offers full-day Summer Art Camps for Youth (Ages 6-10) and half-day Summer Workshops for Young Adults (Ages 11-16). Below is our preliminary schedule of Summer Art Camps & Workshops. We are accepting Camp & Workshop Registrations. Full-day Summer Art Camps for Youth (Ages 6-10) include all art supplies and 2 snacks daily. Students do need to bring a lunch each day. You can register online or over the phone, call Jocelyn at 541-345-1571, or e-mail education@mkartcenter.org for more information. Online registration, Drawing & Painting Like the Pros! Online registration, Art Around the World! Online registration, Mixed Media Play! In this 8 week class, your instructor Amber will be teaching you new and fun ways to create art with all kinds of paper. We will also learn how to turn materials like foil, tape, glue, and newspaper into sculptural masterpieces! Through techniques like papier-mache, we will explore how to build forms and add details to make a finished piece. On the last day of class, family and friends are invited to see your masterpieces in your class Art Exhibit! In this beginning painting class students will have an opportunity to learn and refine new painting techniques using different painting mediums. Students will create 4 finished paintings each one capturing a different subject. We will start class with a basic introduction to color theory using tempera paint. This will be followed by a small composition chosen and crafted by each student. Following our color theory practice painting we will explore watercolor paint and experiment with fun and alternative techniques.The last few weeks of class will be dedicated to learning how to use acrylic paint safely and effectively and will ultimately culminate in two final paintings on canvas. On the last day of class students will be able to show off their work in class art celebration! Get ready to experiment and build your visual communication skills in this digital illustration class! Introduces digital drawing, digital photo editing, and typographic layout to visually communicate ideas using the app Adobe Photoshop Sketch. Students will gain an understanding of the creative process with an emphasis on design principles and the creation/ manipulation of graphics through multiple creative projects, such as digital self-portraits and making their own fonts. Tablets will be provided for all students to work on, and the app we use is free if students want to finish work at home. It may be time for private art lessons at the Art Center! Private Lessons are available for Youth (ages 6-12) and Young Adults (ages 10-16). Lessons will include (4) one-hour sessions with an Art Center Instructor. Weekly meetings. Lessons are available in a variety of drawing and painting mediums and are customized to fit each student's creative interests and schedule. To arrange private lessons for your young artist, please contact Jocelyn at 541-345-1571 or email education@mkartcenter.org.